Summary: "On the faded Island Books sign hanging over the porch of the Victorian cottage is the motto "No Man Is an Island; Every Book Is a World." A. J. Fikry, the irascible owner, is about to discover just what that truly means. And then a mysterious package appears at the bookstore. It's a small package, but large in weight. It's that unexpected arrival that gives A. J. Fikry the opportunity to make his life over, the ability to see everything anew. It doesn't take long for the locals to notice the change overcoming A.J. ; or for that determined sales rep, Amelia, to see her curmudgeonly client in a new light; or for the wisdom of all those books to become again the lifeblood of A.J. 's world; or for everything to twist again into a version of his life that he didn't see coming. 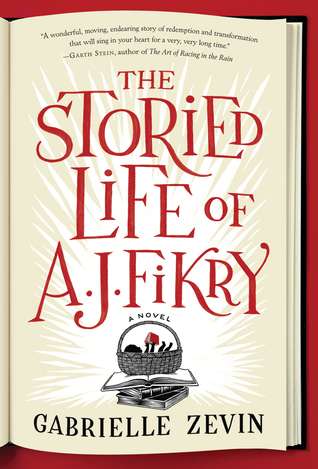 As surprising as it is moving, The Storied Life of A. J. Fikry is an unforgettable tale of transformation and second chances, an irresistible affirmation of why we read, and why we love." Review: I am highly skeptical of books that claim to be "for book lovers." That kind of marketing is kind of like putting a sign in the produce aisle of the grocery store stating "THIS SECTION IS GOOD FOR FRUIT AND VEGETABLE LOVERS." It's just so glaringly obvious. That they thought saying "this book is for book lovers" was the best thing they could say about it immediately made me hesitate. So I probably wouldn't have read this book at all if a friend hadn't recommended it to me so highly. This book is definitely for book lovers. It really isn't an adventurous story. But it is every bit as heartbreaking, as funny, and as clever as other books I've read. The book focused just a tad more on the romance than I wanted it to, but that's just me being the curmudgeon I am. It was still a delightful read. This book is like a warm blanket, and I loved cuddling into it. Highly recommended! Bottom Line: This book is so warm and funny and heartbreaking and witty... you will have a blast reading and be sorry when it ends. I'm a book lover! I need to read this! Your grocery store comparison made me laugh. Yes! I would definitely recommend it. There is occasional swearing, but it wasn't enough to bother me. But I thought I should mention it in case you're sensitive to language. Do let me know if you read it! Great review! I have had this one in my TBR stash for too long - really need to read it sooner rather than later in the new year. It's definitely a warm fuzzy book. Hope you enjoy!